After a month spent in delightful lollygag mode, Felkerino and I pumped up the tires on the Co-Motion Java tandem for our first century ride of 2015. As I rode along looking alternately at Felkerino’s backside and a somewhat snotty top tube resulting from my runny nose, I was wholly grateful for the hours and miles together on our beautiful, sturdy, and maybe somewhat dirty, tandem. One of my favorite parts of our day was riding beyond the edges of Poolesville, Maryland, into more rural countryside. The wind snapped at us over the open landscape and through leafless trees. Chill bit into my feet. Normally, I don’t like those sensations, but on this sunny winter day they invigorated me. It felt so good to be riding our tandem together after a month of rest. We reached the entrance of Sugarloaf Mountain and began our two-mile rise to its summit. Sugarloaf is a mostly gentle (by East Coast standards) switchback climb, and at this time of year the bare trees give you a good lens on the winding path behind you. Bikes are not people, I know, but this tandem has sure found its way into my heart. With a tandem, Felkerino and I sit snugly, one in front of the other. All movement is synchronized, and when Felkerino and I ride in tune it reminds me of playing in an orchestra that has melded every note, sound, crescendo, and pause together. It’s a blissful feeling. When our previous tandem– a custom-sized Co-Motion Speedster– developed a crack, I cried, and didn’t understand why the loss of a bike had affected me so. But it was the first tandem I’d ever ridden that was sized just for us, and we’d had memorable times with it, including our 2011 PBP jaunt. As nice as that bike was, our Co-Motion Java is even better. It was built to tour and made to climb. It fits me as well as the Speedster did. Co-Motion designed it to specifically fit our two bodies, and over a long ride it continues to painlessly support us. Our Java climbs so agreeably and doesn’t mind if you add extra weight to it. It’s happy to carry your extra jacket, or those items you need to pick up at the grocery store on the way home. The Co-Motion is an eye-catching steed, and through it we’ve enjoyed many a nice conversation with people we might otherwise never have met. Cheesy though it may seem, this bike is like a family member to me. I never gave it a name, I just call it what Co-Motion branded it, but our bike is more than a thing we own. It’s an essential element of Felkerino’s and my approach to seeing and feeling the world. Our Co-Motion Java tandem is our partner in intimate exploration. Ooh, tax refund! Now that might provide funds for a tandem for me and the kids:) Hesitant, however, to buy new but our size disparities might necessitate it. CoMotion makes wonderful bikes and, yes, it’s natural to feel like a bike is part of your family when you spend so much time on them. I missed mine while I was out of town for a week. It really is a beautiful bike. Makes my old steeds jealous. Yes, you are right! Thank you for the link to the essay. I’ve been thinking a lot about the “third thing” this week. I don’t know that I would be able to let go of those tandems, either. the feeling is well understood at our house. 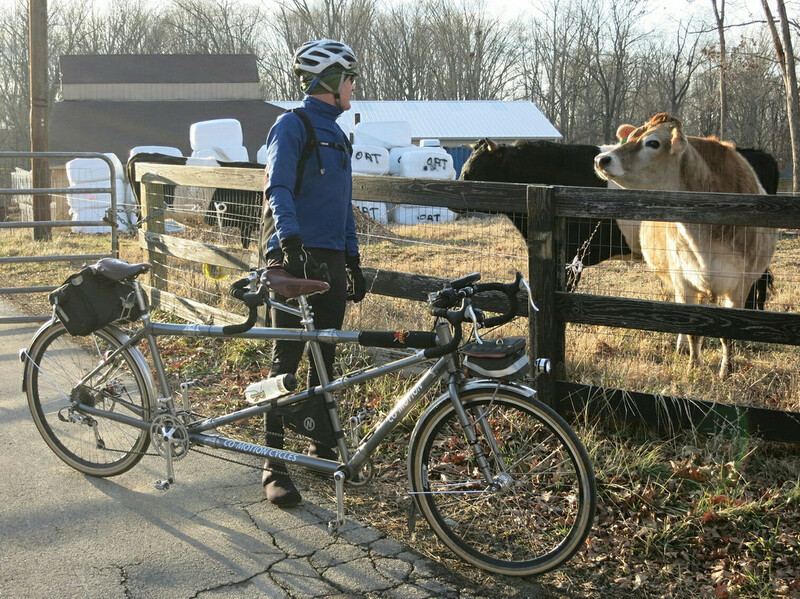 our older but relieable 1972 schwinn paramount tandem has that sort of feel. I can imagine! I bet it’s lovely. MG, My wife and I also rode in the Virginia countryside on the 18th, but we did 33 miles, not 100. Those types of distances will have to wait for summer in our case. I read your article on doing the Seagull century last year. I did it also (for about the 15th time). I rode the Snow Hill route. It isn’t quite as nice (no Assateague) but it’s a whole lot less crowded. Thanks for the thoughtful posts.